It has been 3 years since Star Wars: Galaxy of Heroes has been released to the public. 3 years of collecting our favorite Star Wars heroes and figuring out what the most efficient way to build our roster and collect was. Struggles in arena, fleet... Jedi Knight Revan (let's not get into that). A lot has happened in the past 3 years. 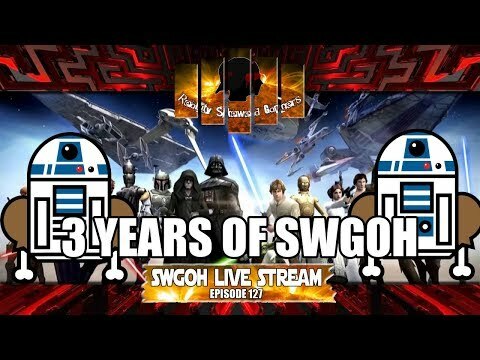 Let's review what the anniversary gifts from CG are and reflect on the last 3 years of SWGOH in this episode of the SWGOH Live Stream.